An easy way to make a difference right now is to send a letter out to the people below and let them know how you feel about having a massive open pit mine in the heart of Canada's oldest closed-canopy forest. There are many reasons why having a mine on such a small peninsula is a bad thing. click here for a list of some reasons. The Caren Range is home to the Marbled Murrelet - a species at risk. The noise, light and air pollution and loss of habitat puts this species further at risk. On the Caren Range resides the oldest closed-canopy forest in Canada. The open pit mine will not only reduce some of this forest containing a ancient ecosystem but will also take away from the beauty of what is left by the far reaching effects of the mine's many types of pollution. Otter Lk, which is included in the PPA study has drainage into Anderson Creek which is Salmon bearing. Disrupting the water quality of this creek will have negative consequences. Otter Lk also has drainage which ends up in McNeil Lk, a water source for the hundreds of residents of Pender Harbour. The Pender Harbour area already has an arsenic problem. A 200meter open pit mine just 6km away has the potential of not only contaminating surface water with arsenic but also has the real potential of contaminating many wells that residents depend on for their water supply. The light pollution from the mine will not only disturb local wildlife surrounding the mine, it will also take away from the cherished dark skies in Pender Harbour which will have a negative impact on attracting tourists who are trying to escape the light pollution of the big cities. 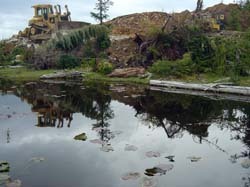 Daily blasts and the low rumble of operating machinery at the mine site will be heard within Spipiyus provincial park and in the Pender Harbour area. This will negatively effect the tourism industry. The proposed transportation of ore from the mine site to the ocean involves an 11km conveyer belt that will cover 70% of the width of the Sechelt Peninsula. PPA states that their will be wildlife corridors, however there will still be a negative impact on the well-being of local wildlife. Instructions: Select one person below you would like to send a letter to and then complete the fields below. Click back to this page to send a new letter to another individual. Please be sure to personalize each letter and try to be specific and say in your own words why you do not want an open pit mine on the Sechelt Peninsula. Note: Probably the most important person to email in this list is the Environmental Assessment Officer who is working on this project, Autumn Cousins, so be sure to at least email her. Note: We have received confirmation from Nicole Del Raye (EA Administration Assistant) that all emails sent are treated the same as a written physical letter. Emails are printed out and filed. Here's an opportunity to practice conservation br emailing your letter. PO Box 9320 Stat. Prov. Govt.